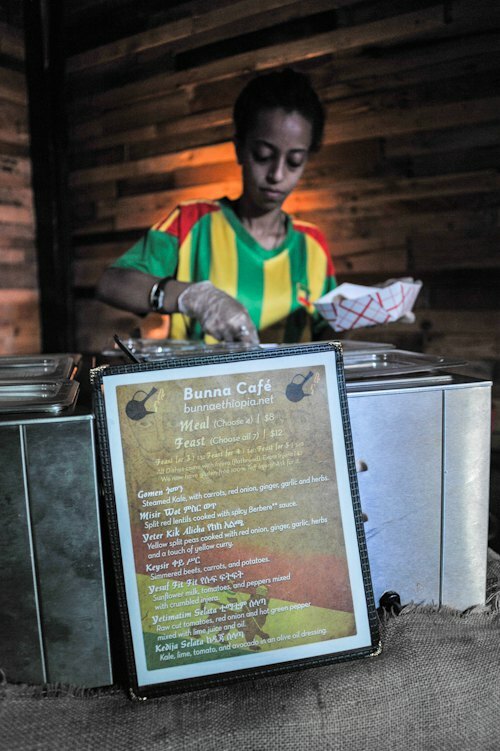 Bunna Cafe has become a staple in Brooklyn's pop-up food shop trend, bringing their mouth-watering Ethiopian food to bars and fairs in Bushwick and beyond. You may have seen them dolling out the Injera (Ethipian spongy sourdough bread) at the Bushwick Block Party last summer, rocking it at the BK Night Bazaar this winter, or as the busiest booth at Pine Box's Vegan Pop Up shops every second Saturday of the month. If you haven't been able to catch up with this ambitious on-the-go restaurant yet, your opportunities are becoming more numerous. Bunna now does monthly dinner parties and cooking classes and are throwing very special event this Saturday! 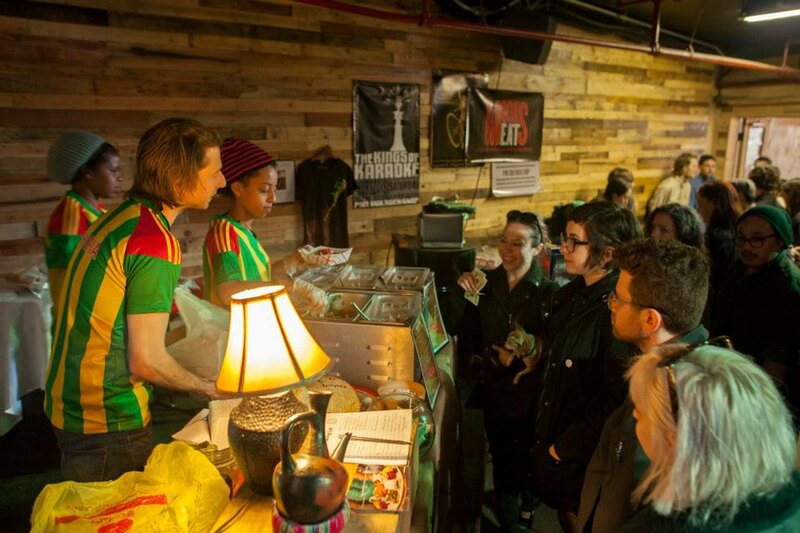 Read on to learn about how their business embraces Ethiopian culture and how they are spreading the love here in Brooklyn. Sam Saverance of Bunna. Photo by Maria Gotay. 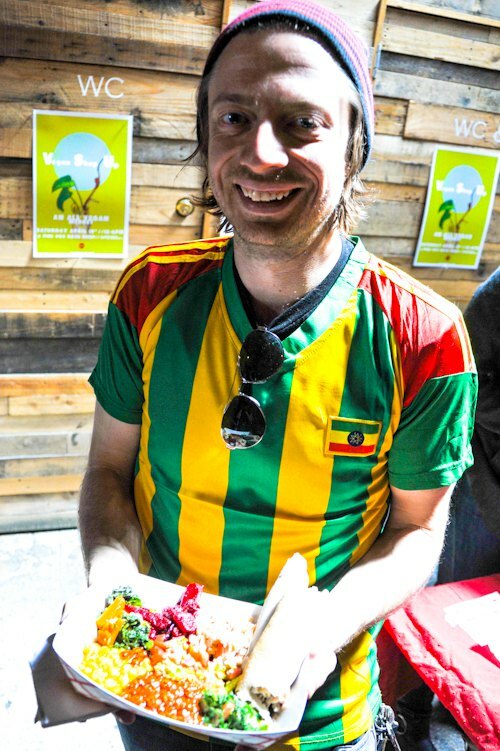 Bunna Cafe was started by one of Bushwick's friendliest guys, Sam Saverence, who fell in love with African culture and became especially interested in Ethiopia during his travels. He and his business partners see Bunna's popularity as a way to bring positive awareness to Ethiopian culture. They hope to eventually funnel this attention into creating a stronger Ethiopian market and supporting Ethiopian businesses through specialty imports. Sam says what they are doing is "the best way to create honest, positive change and perception for a region that has mostly been identified with poverty and need." What better way to shed light (and financial support) on an underappreciated culture than by sharing their traditions and delicious cuisine with others? What's on the menu? photo by Maria Gotay. 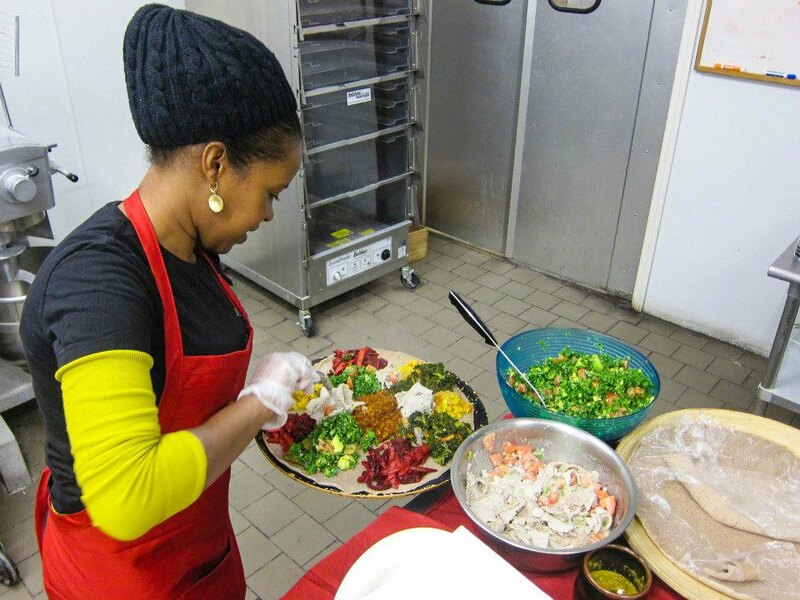 Bunna emphasizes the best of Ethiopian food by serving all-vegan dishes that appeal both to Ethiopia's tradition (almost all Ethiopians will go vegan during fasting seasons) and also to Brooklyn's health-conscious population. Some of their signature dishes include Kedija Selata (kale with avocado, tomato, jalapeno, and lime), Yater kik Alicha (yellow split peas, red onion, ginger, and yellow curry), Gomen (steamed kale, carrots, and ginger) and Keysir (beets, potatoes and carrots). Both meat eaters like myself and vegetarians will be impressed by the variety of flavors and textures in one plate. In one word, it is delicious. 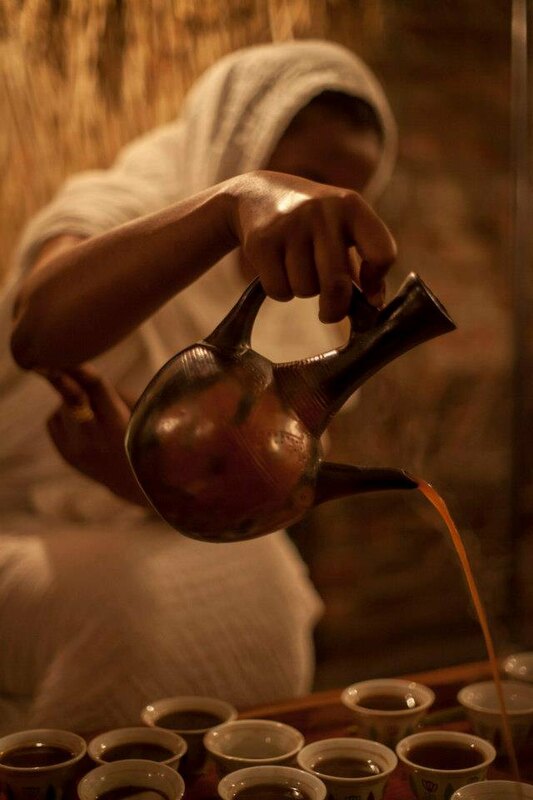 The cafe also hopes to share the traditions 0f Ethiopians who consider dining the most important time of day and associate many spiritual motifs with the process. Ethiopian food encourages sharing and Bunna's platters are made for sampling with your fingers and splitting among friends. Eating Ethiopian food is a very sensory (and finger-licking) experience, and one that should involve friends, entertainment, and appreciation. We can get on board with all of those ideals! Bunna's Habasha Nights party. Photo by Cody Swanson. Bunna's coffee ceremony. Photo by Cody Swanson. Live music. Photo by Cody Swanson. It makes a lot of sense that Bunna's events are more than just a bite for dinner. 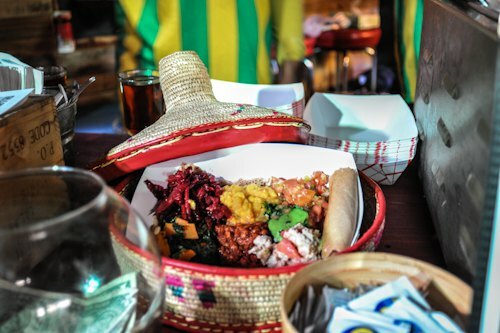 Their monthly dinner party called Habesha Nights, which pops up one Sunday a month at a secret Bushwick establishment, is a social event of all sorts, including live performances and an Ethiopian coffee ceremony. The coffee ceremony, pictured above, is one of the most memorable parts of the night and involves a 20-30 minute coffee making ritual where the hostess brews a batch from raw bean to robust brew. This experience is enveloping and educational, and you're encouraged to observe the ancient practice with all of your senses. Bunna Cafe's parties are for sharing delicious food, meeting friendly people, and becoming immersed in a culture, if only for a night. 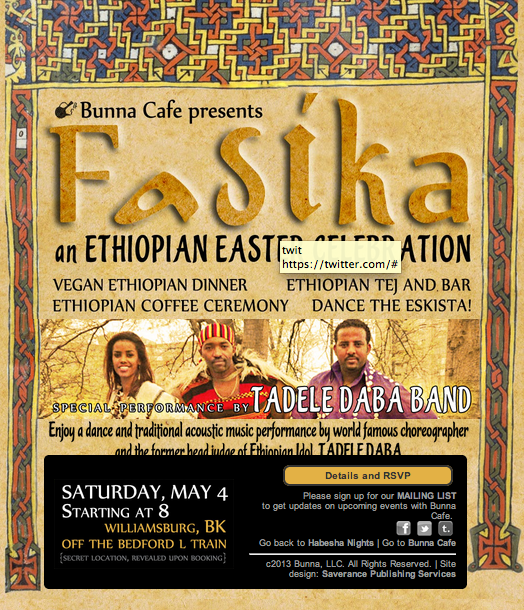 Their upcoming event is Fasika, an Easter celebration, and will include music and dance from world-famous choreographer and former judge of "Ethopian Idol!" TadeleDaba. Full information on their upcoming events can be found here. Bunna's cooking class at global kitchen. Photo by Cody Swanson. Bunna is also spreading the kitchen love by doing cooking demos where you can learn how to cook Ethiopian yourself! 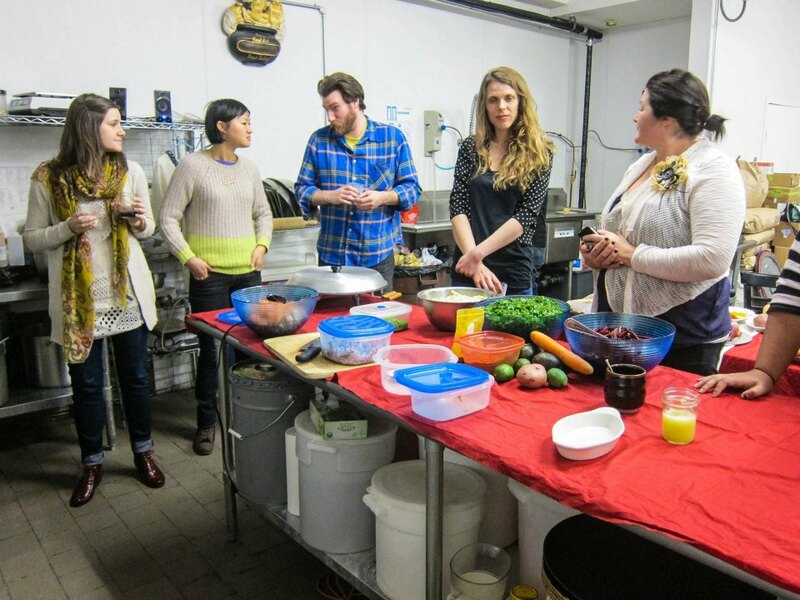 They successfully host these cooking and dining parties monthly at Global Kitchen off the Montrose L stop. They also were kind enough to share their recipes on Global Kitchen's wonderful website, where you can read about how to cook their dishes at home! Best bite EVER. Photo by Maria Gotay. Ready to immerse yourself in all things Bunna? You'll have to chase them a bit - they're the busiest kitchen around! 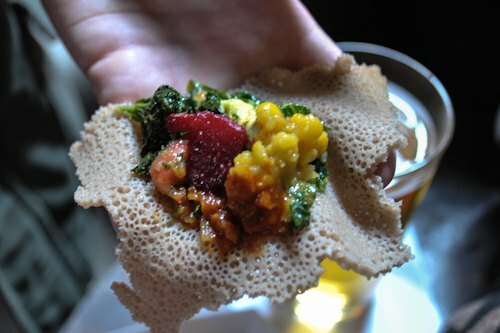 Just this month they've got their upcoming Fasika party, their monthly Bushwick party (next happening May 19), and their monthly cooking class at Global Kitchen. The rest of this summer, they'll be at Hester Street Fair and are planning another BK Farm and Flea music, film, food, and fashion show in Bushwick for August. 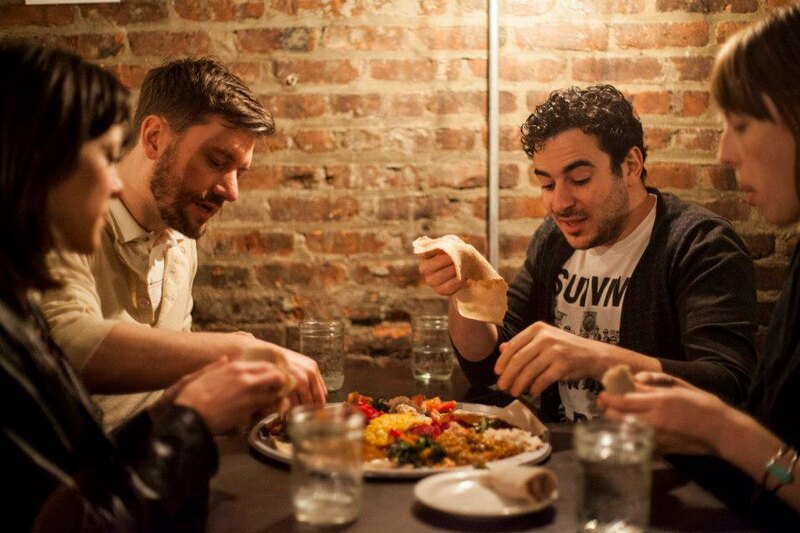 Plus, they'll be popping up for Bushwick Restaurant Week June 17-22. 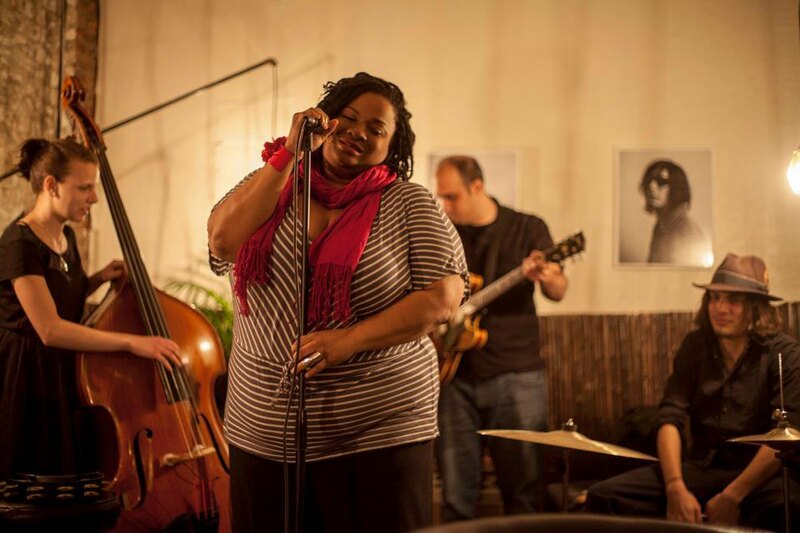 Sign up for Bunna Cafe's mailing list and visit their events page to find out what's coming up.